Not long ago, I traveled to Henry County, Virginia. Although the First Lady has roots in eleven states, her ancestry is most heavily concentrated in this vicinity. Fully one-quarter of her heritage traces to this region. Back in January 2009, I began researching Michelle Obama's roots, and since then, I've shared bits and pieces in a series of articles and talks -- including this past weekend when I spoke in Spartanburg, South Carolina about the challenging research involved in following her Shields branch in reverse from Chicago to Birmingham to several towns in Georgia and finally to Spartanburg. While there, I was the recipient of much assistance and kindness from the Bassett Historical Center. For that reason, I was delighted to read Eliza's Winston's article, Register at Bassett center key to Obama research, in today's Martinsville Bulletin. 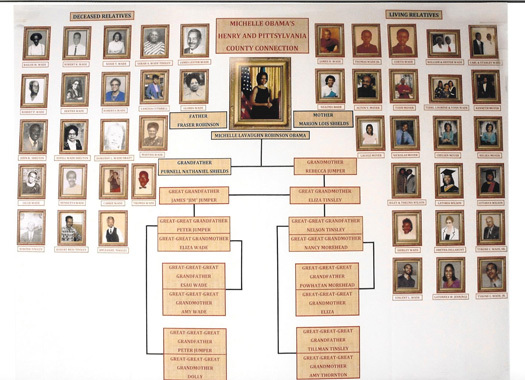 In addition to highlighting the Center's contributions to this research, Ms. Winston shares the work of local genealogist, Beverly Millner, who has assembled an exhibit that features dozens of Michelle Obama's local cousins. I've included a miniature version below, but those wishing to take a close look can visit the Fayette Area Historical Initiative African American Museum (FAHI) in Martinsville, Virginia. Having extensively researched African American families in Henry County for decades, Mr. Millner was well-equipped for this undertaking. His inviting display includes both living and deceased relatives, mostly through the Wade and Tinsley branches of the First Lady's family tree. Esau Wade, a great-great-great-grandfather of Michelle Obama's, was one of her more intriguing ancestors. Born into slavery in the early 1820s, he was crowding his 40s when the Civil War began. Although the war undoubtedly affected his life and family in many ways, it had its most direct impact toward the end when a requisition from the Virginia Governor mandated the provision of ten percent of Henry County male slaves between the ages of 18 and 55. On January 7, 1865, Esau's then owner, John D. Wade, sent him for examination to serve the Confederacy by furnishing labor for public works. I suspect that Esau was particularly fit as he was the oldest man not exempted from duty that day. No record of his service has been unearthed so far, so it may be that it remains to be found or that he was able to avoid serving since the war was entering its final stages. But it makes me wonder. Though present-day Virginia Governor Bob McDonnell revised his Confederate History Month proclamation of last month to include mention of slavery, how many remain unaware that many slaves - including perhaps this ancestor of the First Lady as well as so many others in Henry County today - were obligated to serve the Confederacy? That's a topic worth exploring as the sesquicentennial of the Civil War approaches.